This ice cream is unbelievably easy to make. It’s a good thing, too, since it doesn’t seem to last long in our freezer. 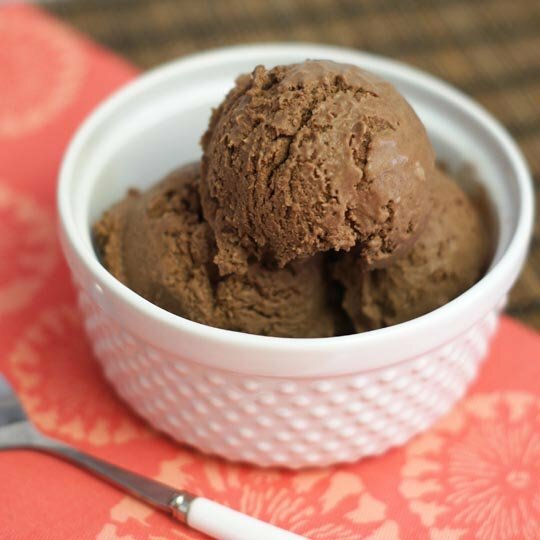 Using only a handful of ingredients, including coconut milk as the base, this chocolate ice cream is a great alternative for those of you looking for a cold and creamy treat, but would rather avoid the traditional dairy version. The result is just as decadent-tasting as the real thing, but lighter on your digestion. You don’t even need an ice cream maker to prepare it! Note: Alternatively, you could use an ice-cream maker at this point, which will freeze your ice cream in about 20 minutes. Simply follow the manufacturer’s directions. 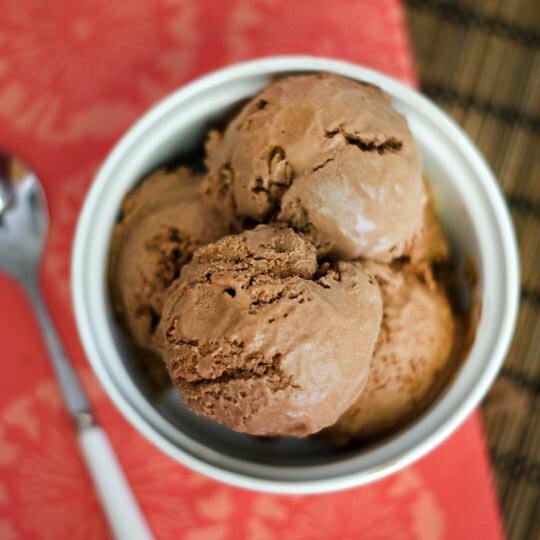 Using only a handful of ingredients, including coconut milk as the base, this chocolate ice cream is a great alternative for those of you looking for a cold and creamy treat, but would rather avoid traditional dairy versions. The result is just as decadent-tasting as the real thing, but lighter on your digestion. You don't even need an ice cream maker to prepare it! Alternatively, you could use an ice-cream maker, which will freeze your ice cream in about 20 minutes. Simply follow the manufacturer's directions. Reader Feedback: What’s your favorite ice cream flavor? Have you tried coconut milk ice cream before? OMG I LOVE YOU MEGAN!!! we have made so many of your recipes this week… unreal!! you have given us a new perspective on paleo living!! wow you are awesome!! I see I’m a little late in commenting on this recipe, but I just found it and tried it last night. I can’t eat sugar or dairy (or grain) and its been years since I ate ice cream. OMG! This never even made if to the freezer!! After 25 mins in the Ice cream maker, it was a firm soft serve consistency. My husband and I knocked it off straight out of the machine! My kids (I have seven, thank G-d) said it tasted better than Friendly’s ice cream!! Thank you for how you bring food normalcy back into the lives of people who are so restricted in what they can eat. Good luck with your pregnancy and enjoy your little miracle when he/she arrives. BTW I subbed xylitol for the honey. Just made this with my ice cream maker. I let it churn for 30 minutes at it had a wonderful soft-serve texture. I used 1/4 cup carob and 2 T raw cacao, and filled my 1/4 cup measure with part honey, agave, and maple syrup. Delicious! This ice cream is amazing! I have a Krups ice cream freezer, so mixing this in my blender, pouring it in there, and in about 15 minutes, having deliciousness to enjoy, perfect! I use King Arthur Flour’s Double Dutch Dark cocoa, too- so this is deep, dark, and healthy with all the dark chocolate benefits. Thanks so much for this recipe, and I will try more of yours, since I found your site! I tried this recipe and substituted 1/2 Maple and 1/2 DAte syrup for the sweetener and it ROCKS! Great recipe! What percent fat do you use in your full fat coconut milk? Let me echo the praises of others, this is delicious. I used maple syrup for the sweetener. Tastes like a luxury ice cream! I LOVE this recipe! I have an unreal addiction to iced mochas, and that stinks when you’re trying to go paleo. I froze this recipe in ice cube trays, so I can pop a couple out, toss it in the blender with my coffee (or just in a cup of coffee if I’m in a hurry). Ta-da! Paleo mocha breakfast smoothie! My 12 year old grandson made this ice cream today using organic maple syrup for the sweetener. Wow! Absolutely delicious and very satisfying because the cocoa powder gave it a flavor of very dark chocolate. We will definitely make it again. Thanks, Megan – your recipes are fabulous. Hi Megan, thanks for getting back to me so quickly, I know you must be busy trying to answer everyone!! I would like to try an add strawberries but I only have Frozen ones. Can I use and how would I use them? and how many? Thanks, don’t mean to be a bother. Hello, I just tried making this but just with Coconut full fat milk, vanilla, honey and a little Xylitol. I also added 2 tsp or Arrowroot powder. I churned it for over an hour and it didn’t do anything. It stayed liquid the whole time. I did put the mixture in the fridge for 2 hours before putting in the frozen ice cream maker. It is in the freezer, I went to stir it after30 minutes and it was not frozen anywhere. Can you help me please?? 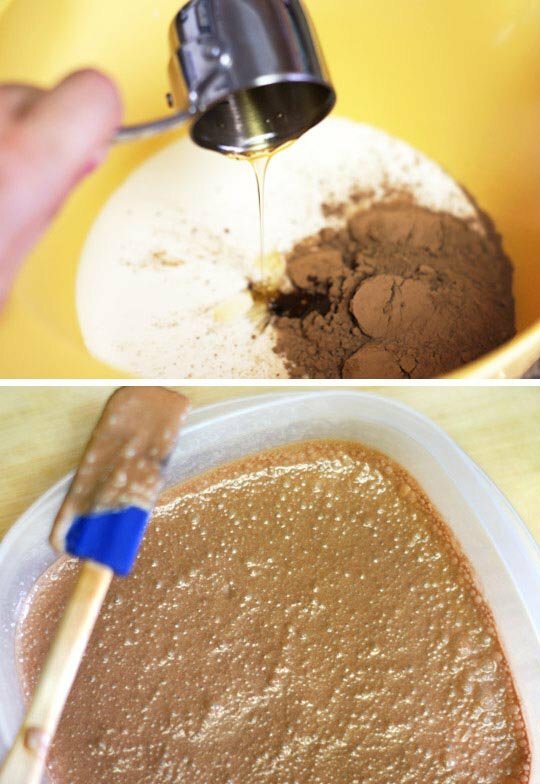 I would try placing the mixture in the freezer for an hour, then try churning it again in the frozen bowl. Personally, I’ve never gotten my ice cream maker to thicken any non-dairy recipe, which is why I usually skip that part and stick it directly in the freezer to firm up. It will harden, but if you allow it to thaw for 20 minutes or so before serving, it becomes scoop-able. Best of luck to you! Hi, do you think this recipe will also work with Silk Coconut Milk? I couldn’t find the canned anywhere! I don’t think Silk Coconut Milk has the same texture or fat content as canned coconut milk– you need that fat content to create a creamy, rather than icy texture. The canned version can be found in most grocery stores where you’d find Thai curry paste and spices. This is very good. I did find it quite hard- not soft and creamy like ice cream. This does make great ice pops- tastes like fudge sickles. Oh my gosh this is so tasty! I am going to a vegan dinner in a few days, and I think this will be perfect. I quadrupled it, and it is in the ice cream maker right now. We just made this, ooh my , so DELISH!!! For the two extra tablespoons of cocoa I used Hershey’s special dark cocoa, and also raw honey for the sweetner,very very nice. Whipped it up in minutes in my Kitchenaide icecream maker. Wow! This recipe tastes amazing! I made it in my Cuisinart ice cream maker and in minutes, pure delicacy! My boyfriend and I killed it in 2 really large servings. 🙂 Thank you for the post and I look forward to trying your other recipes! Im such A dork! I just noticed at the top of the instructions where it says servings! I swear I looked everywhere. Don’t mind me, I’m just being blind;-) thanks a bunch! I can’t wait to make it. Could you make this into vanilla coconut milk ice cream by omitting the cacao powder? Just tried this recipe and it is AMAZING! I really love your website Megan, can’t wait to try out all of the other recipes, especially cauliflower pizza crust! This is amazing, thanks! Just too good 🙂 I made with liquid stevia, about 20 drops, and its lovely and sweet. Have to try not to eat it all in one go! I made this last night and I’m enjoying it as I type. A nice creamy, chocolatey treat. I think I might add chopped almonds next time. How do you get yours to stay creamy? I made this and it has lots of ice crystals in it. I think if you let it thaw on the counter for 15 minutes or so, it gets creamier as it thaws. When it’s frozen solid, it is a little icier. Did you use the carton of coconut milk that you were referencing above? If so, that’s why it got icy. The lower fat content is what can make vegan ice creams icy. Same goes for if you use a can of low fat coconut milk. It’s best to use the full fat versions. Also, someone above was asking about the ‘coconut creme’ from Trader Joes. That’s just TJ’s marketing but it’s really just plain ol’ full fat coconut milk so you’re fine. If you want to double up on this recipe or others, you can use one can of full fat coconut milk & one can of low fat and you’ll be fine. Or you can use soy creamer in place of the low fat coconut milk if you want less of a coconut flavor. Just remember, it’s all about your fat content. Also, a small amount of vodka has worked well for people as it prevents that icy texture. In any case, you may find that letting the ice cream sit out before serving (10-15 mins as stated above) is a helpful addition. Actually, the Trader Joe Coconut cream is a full can of the cream, rather than mostly or partially cream. If you put it in the refrigerator to chill and separate, you won’t have any watery part–just cream. I’ve been making coconut milk ice cream for a while now. My husband’s favorite flavor is peanut Butter. 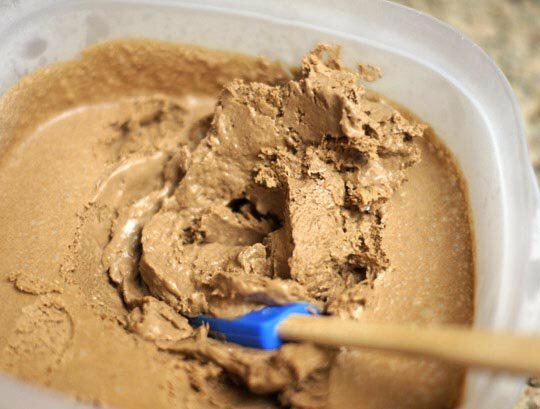 It’s the exact same recipe as this post, however, instead of cocoa powder, I use peanut butter. Sometimes we add homemade hot fudge as well. We both agree that it’s the best ice cream we’ve ever had. Ever. Great, thanks – I will give it a go! I live in Australia and don’t have a TJ’s…. If you’re referring to Trader Joe’s Coconut Cream, I tried using that and it worked just fine! I just finished making this and wooow.. SO GOOD! I actually used coconut cream in place of milk, and made it into like a mousse that I could eat straight away, seriously delicious.. thanks so much for the recipe! The faster you can eat it, the better. 😉 Glad you enjoyed it! Make sure the coconut mik you use contains no crap like carrageenan. Carrageenan will cause huge health problems. oh my…i made this last night and it is sooooo ood, i used agave instead of honey and made it in my ice cream maker….delicious! Thank you so much for sharing this. Thanks for the recommendation on the BPA-free coconut milk from Amazon.com. I have two cans left and will look to ordering this one you mentioned. Recipe looks great! Easy and quick. I’m trying to cut back on banana consumption and this will take care of my ice cream fix. Thanks! Can you use canned light coconut milk? What about Chocolate Almond Breeze almondmilk? I used canned light coconut milk and it worked just fine! I’ve also made ice cream with almond milk, so you’re good to go. Thanks for letting us know, Robin! I also have the “So Delicious” brand Coconut milk in my fridge to use up within the next couple days, so this is a perfect! Its in the freezer now, so I will also report back to let you know how it turns out, but in the liquid state it tastes delicious enough to just drink! Thank you for all these amazing recipes! Isn’t cocoa powder something different than cacao powder? Cacao is simply the raw, unprocessed version of the bean from the cacao tree, while “cocoa” is what it’s typically called after it’s been cleaned and roasted. I prefer to use the raw version in my recipes, which is why I link to the brand I use, but many people are more familiar with the term cocoa powder, and it can be used interchangeably with very little difference in flavor. In this heat, I am so addicted to your peanut butter banana ice cream…but this will be a nice change, I’m going to make tonight!! Megan this sounds amazing. Great alternative to banana ice cream! I made a twist on your Grain Free Shortbread cookies that I’ll be posting later this week. Awesome! I have a half gallon carton of unsweetened coconut milk (So Delicious brand) in the fridge now…I wonder if that would work, or if it needs to be the canned variety? I feel like that type of coconut milk has a different consistency than the canned stuff, but let me know if you try it! I’d love to hear how it goes. “Ice Cream” needs the fat of the canned coconut milk to taste rich. Using the lower fat coconut milk from a carton will make a frozen ice rather than cream. Add 4 or 5 egg yolks into the mix and your So Delicious coconut milk should work fine. I still prefer the canned coconut milk, but adding the egg yolks will allow you to still approximate the texture with the carton milk. This looks amazing and I can’t wait to try it. I love coconut milk ice cream, so now I have to try making my own! Do you think raw cacao powder would work in the recipe? what is the difference between cocoa powder, cacao powder and raw cacao powder? Is cocoa made from the cacao bean, therefore leading to ‘cocoa’ and ‘cacao’ interchangeable? How does ‘raw’ associate with cocoa? Is all cocoa raw since the powder of cacao? Thanks! I just found my answer below! I love your recipes! Everything tried is great!! I want this!!! Chocolate and coconut are my favorites and the fact that this only has 4 ingredients makes it that much better! Pinning for sure! Love coconut ice cream! Would stevia as a sweetener work out ok in this recipe? Yes, I think it would work just fine! Hello, your recipe was amazing! Would low fat coconut milk work too as the full fat milk gives me a stomachache? Thank you. I love how you turned it into ice cream! Definitely trying that now :).